Wharf Local at Tathra is beautifully situated over the water. Photos: Somersault Media. 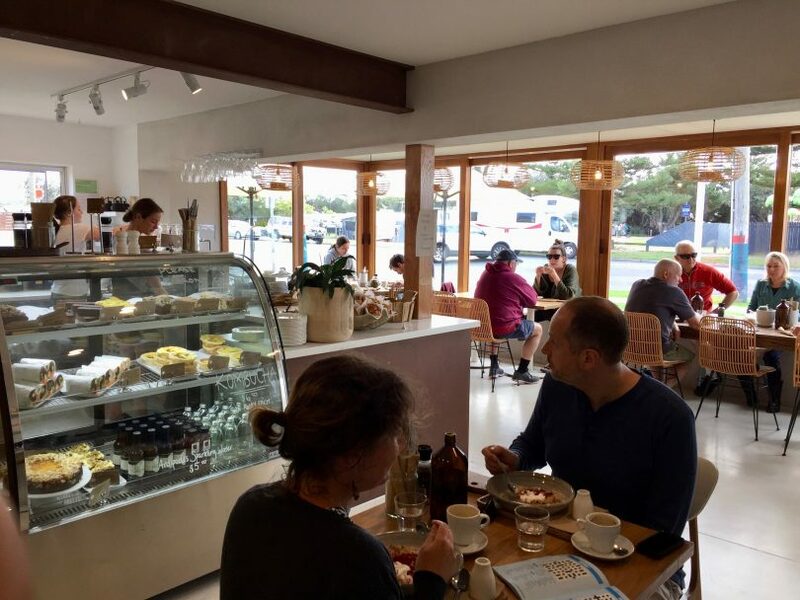 The beautiful tourist drive from Tathra to Bermagui, winding through the Mimosa Rocks National Park, is worth it for the scenery and secret swimming spots alone, but you can also please your palate with a stop at one of the outstanding cafés along the way. 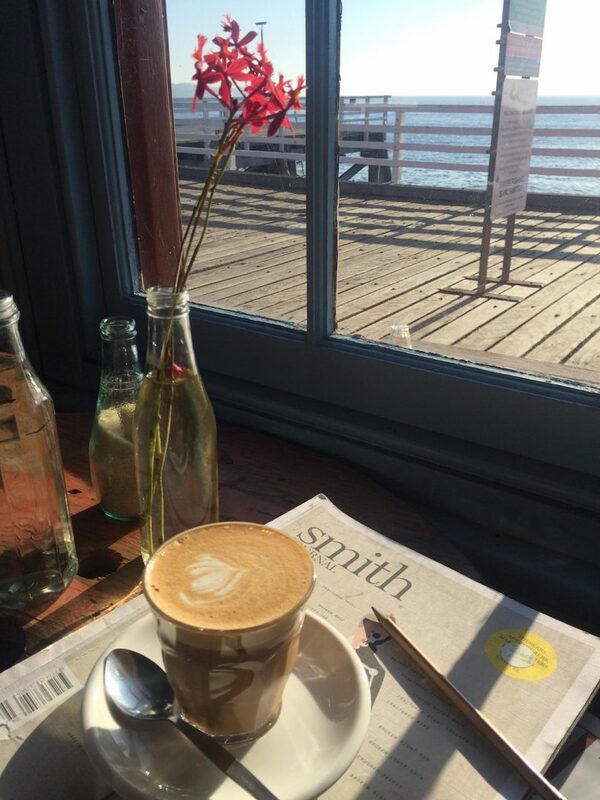 If your idea of a morning coffee is quiet contemplation staring over the sea and listening to water moving under the boards at your feet, then you must visit the Wharf at Tathra. The coffee here is excellent – strong and full-flavoured, loads of caramel and chocolate. A long cabinet is laden with the most beautiful cakes, tarts, pastries, sandwiches, and salads like sweet sesame broccoli & edamame salad with quinoa, or roast eggplant with sofrito, chickpeas, almonds and rocket. The cafe is also a stockist for the amazing Honorbread Sourdough from Bermagui. Magazines, flowers, local crafts and art, ancient doors, piles of croissants – every corner of The Wharf looks like a photo shoot for a food magazine – these people have style. This is a place you can linger watching the fishermen and seabirds, mingle with the locals and of course even see whales breaching in the season as they broach the Tathra headland. Park at the top of the hill near the Tathra pub to take in the full vista walking down towards the emerald waters. Blend Cafe at Tathra has a French accent. Blend is set back off the road opposite the beach at Tathra, and they do a few things well here. The coffee is great, and there is a choice of blend, so spend some time discussing this with the helpful staff. I chose the award-winning Black Cyclist bean on my visit and wasn’t disappointed. Of course, then you have to choose between house-made pastries, still-warm sourdough, tarts, a sensational Croque Monsieur filled with double-smoked ham and house-made bechamel, seasonal salads, or some take-home decadence from the cheese cabinet. You may be served in French if you’re cheeky. Owner Bronnie knows her cheese so get her to show you around Blend’s well-stocked cabinet, plus all kinds of kitchen and coffee making paraphernalia. Want more? Blend is baking sourdough every day except Thursday. Recommended: The Almond Croissant. Wild Orchid cafe is a sunny newcomer to Tathra. Somehow this café feels like an extension of the beach – it’s all sunlight and air. Opened earlier in 2018, the space has huge windows, polished concrete and sand-coloured fittings, brown paper and healthy, rustic food. Staff are extremely friendly and the place bustles with happy locals. We order a stronger coffee here as we’ve learned to do with the Wild Rye’s Seasonal Blend, and it’s well-made and delivered promptly. We sit looking out over the front lawn area, scattered with bean bags and many happy locals and dogs. Enjoy Wheatley Lane organic sourdough, dukkah-crusted free-range eggs, lamb kofta with quinoa tabouli, house-made goat cheese tarts – yes, that kind of simple. There’s very good energy here. Watch the surfers at Tathra Beach from The Gap Espresso. Reopening after a brief closure and serving from the convenient time of 6:30 am, The Gap Espresso is a lofty, light and gorgeous space for an early morning coffee. 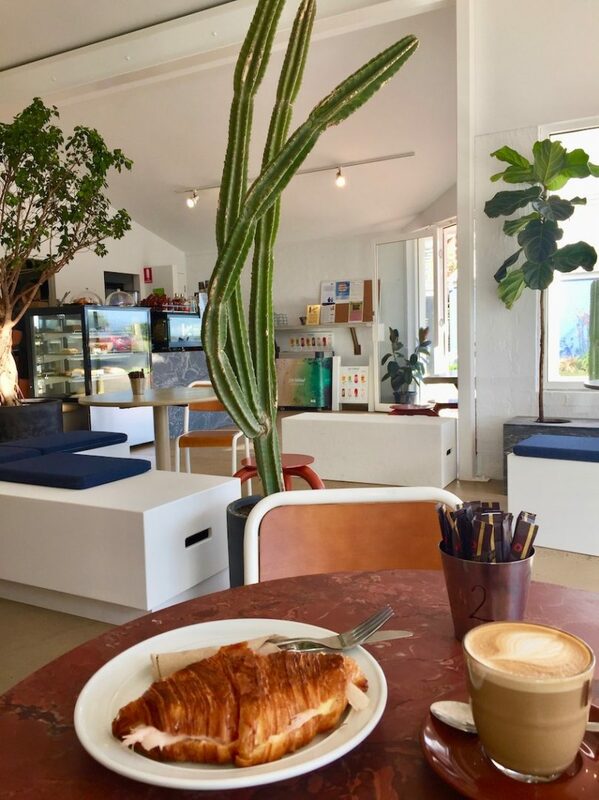 Wild Rye’s crunchy croissants filled with ham and cheese, muffins, raw goodies, vegan and vegetarian bowls and salads grace the very small menu. Coffee is well made, and sitting in the sun streaming in through the huge front windows watching swimmers and surfers back from the beach is the essence of Tathra. 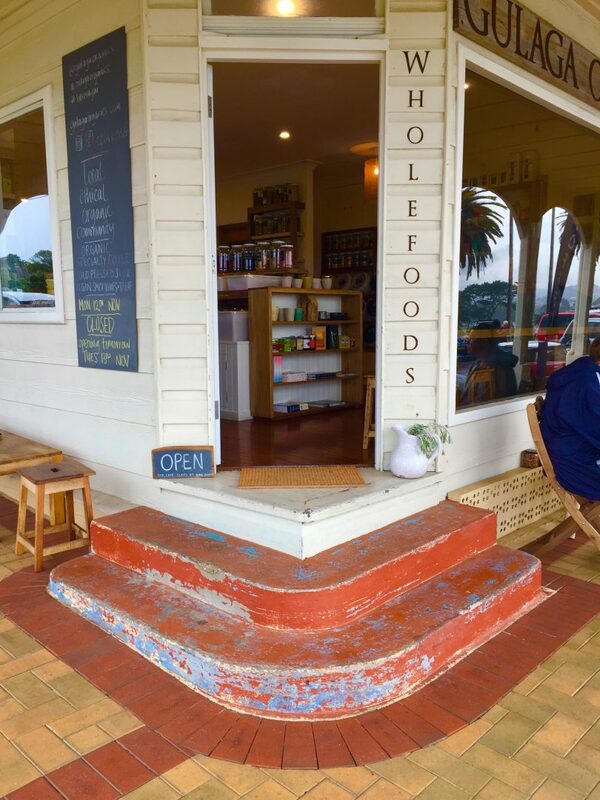 Organic produce is a focus for Gulaga Organic at Bermagui. If you like your coffee to be ethical and sustainably grown, this is the cup for you. Our single shot latte was full of flavour and was a decent colour and strength. This is the third great coffee to be had in Bermagui, the others being from Mr Hope and Beardhawk. You can poke around in the organic produce while you’re here, maybe pick up a bag of the sensational raspberry liquorice (you’re welcome), some raw chocolate or house-made treats. Or if you’ve done your dash with the ‘espresso bar’ for your day, dive into a plant-based cacao, berry or green smoothie or a cold-pressed juice from the ‘goodness bar’. The verandah is wide and beautiful, wrapped around this lovely old corner building, and the view is over the bay to Our Lady Gulaga, so sit and spend some time soaking up the breeze. Eastwood’s at Bermagui has links to River Cottage. A combined café, deli and cooking school in beautiful Bermagui? That’s right. Saturdays devoted to the worship of brioche donuts? Yes indeed. Contemporary fit out and gourmet product? Right again. 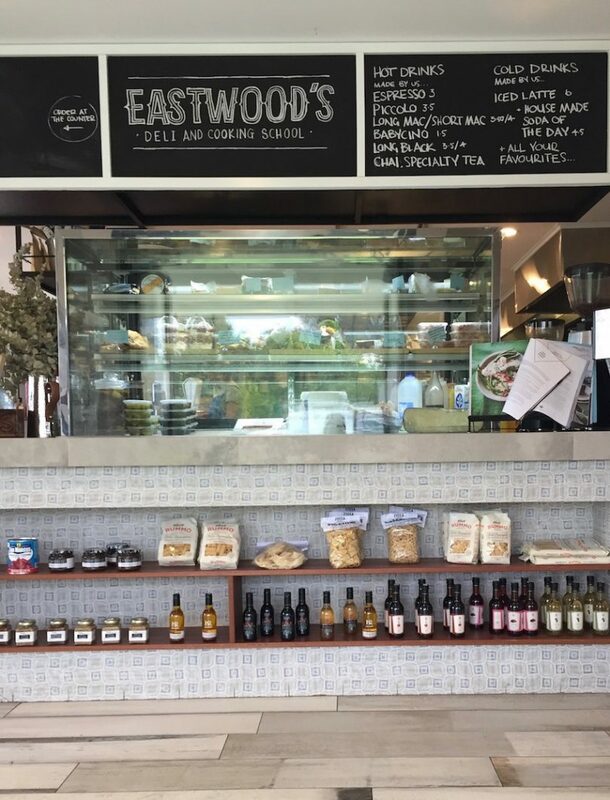 Eastwood’s is the newish enterprise from Kelly Eastwood, who appeared on ‘River Cottage Australia’ and here she replicates the TV cooking classes she ran in Tilba during her time with that show. Menu includes sandwiches from the deli, loads of fresh, crunchy salads, and you can even find a Vietnamese Banh Mi, or Korean-style schnitzel. Dark Horse blend from Five Senses is served in the café, an extra shot was needed in our case so check with the barista that you’re getting a good hit. The owners of Mr Hope at Bermagui are planning to add a gin bar to their cafe. Mr Hope reminds us of cafés frequented in the back streets of St Kilda during the 80s. A bit retro but classy, eclectic and serving quality product from a small selection. 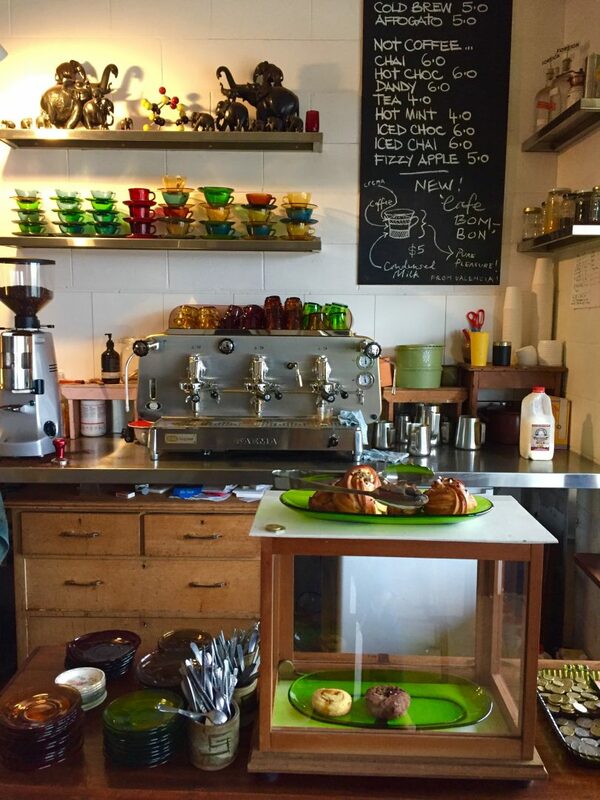 We loved the 70s-coloured latte glass, and the coffee is good. There is an element of trust required and expected here – you sort your own change and patiently wait. Our coffee came quickly and was delicious. Many locals stopped to say hello, and to hug the barista who told us about their special offerings like Café Bonbon – which is coffee over condensed milk – their cold-brew, and Affogato. Having recently changed hands, plans are afoot for a couple of food offerings over summer, longer trading hours and a future gin bar. Now, do we have your attention? That’s right, a gin bar. For now, you can munch on a couple of the more famous offerings from Mr Hope’s neighbours – award-winning Honorbread, like the Salted Rye Biscuits and the sensational Kardamumbulla with your excellent coffee. Basically, if you want to feel like a cool person – go here. Note: cash only. 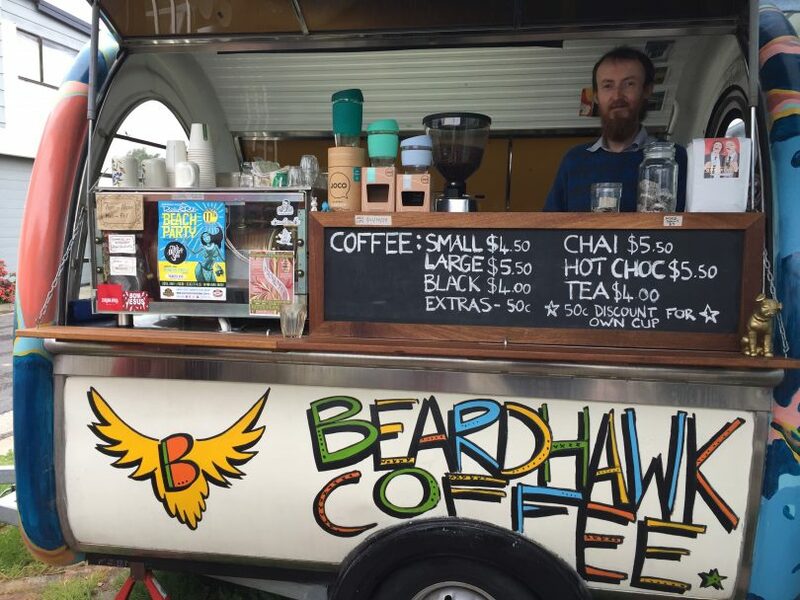 The Beardhawk van at Bermagui is a stripped back venue for excellent coffee. Another great coffee in Bermagui. This striking caboose is parked in the courtyard of the Frame & Brush art shop and stopping for coffee at Beardhawk is a quirky experience. But if your attitude is more “quality coffee over designer furniture” then you’ll be OK here, as the coffee is delicious. A single shot of medium to dark goodness tipped us into the buzz realm. Served in a 1970s whisky glass with no annoying accoutrements like saucers or spoons, we sat under the sky, listening to the local cognoscenti, and learning a few things. There are a few raw, healthy, snacky things we didn’t take much notice of, because again, the thing here is the coffee (and maybe the talk). Only open in the mornings, but if you can handle coffee like this after midday then you’re of stronger stuffs than us! Note: cash only. 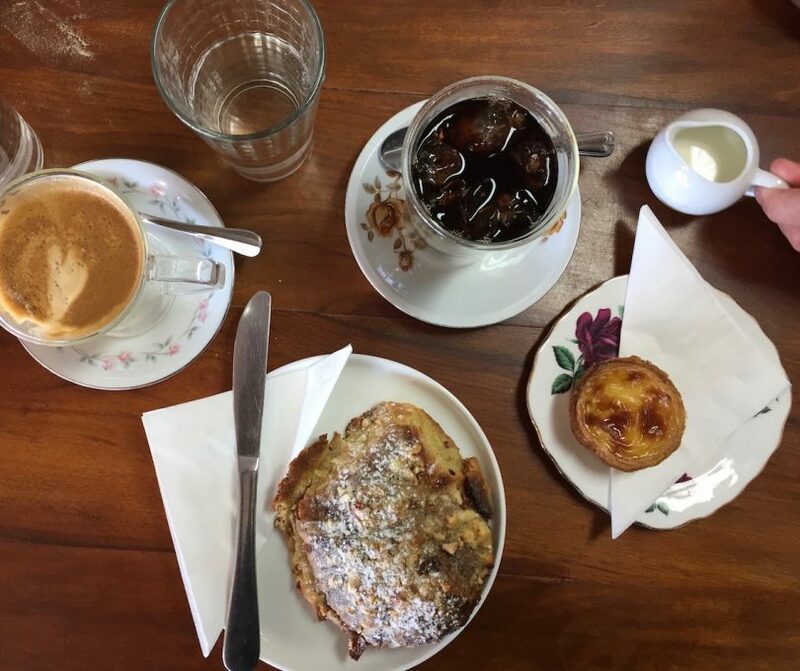 For a preview of the best cafés from Batemans Bay to Moruya, click here. Do you have any Café suggestions between Tathra and Bermagui?